I love a good hike on a foggy Bay Area morning or a sunny Texas afternoon (so long as the latter is not in mid-July), but I’m a bit of a baby when it comes to hauling around an über-heavy backpack. I prefer packing light with some water, snacks, and a few band-aids, all that I need before hitting the trail. Rather than fuss over whether I’ll be craving a sweet or salty snack, I cover both bases with these easy, protein-pumped bars. They have the added virtue of a super-quick prep-time (that’s right – you can procrastinate and make them the day of the hike with time to spare). Follow my lead with the assortment of seeds or create your own backpacking bar-blend. 2. 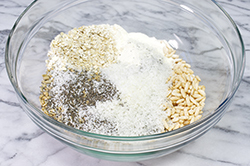 Stir together the oats, cereal, protein powder, pepitas, sunflower seeds, chia seeds, and coconut in a large bowl. 3. In a small saucepan, combine the agave nectar, nut or seed butter, and milk. Heat over medium-low, stirring, for 2 to 4 minutes until mixture is melted and bubbly. Remove from heat and stir in the vanilla. 4. Immediately pour the agave mixture over the oats mixture, mixing with a spatula until coated. 5. Transfer the mixture to the prepared pan. Place a large piece of parchment paper, wax paper, or plastic wrap (coated with nonstick cooking spray) atop the bar mixture and use it to spread, flatten, and very firmly compact the mixture evenly in the pan. Cool completely. 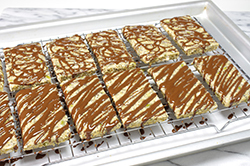 If desired, spread or drizzle with the bar coating. Refrigerate at least two hours until very firm. 6. Using the liner, lift the mixture from the pan and transfer to a cutting board. Cut into 12 bars. MELT 1/3 cup semisweet, bittersweet, or natural white chocolate chips in a microwave or double boiler according to the package instructions. WHISK in 2 teaspoons virgin coconut oil until blended. 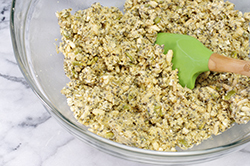 -	I like to use already-roasted, lightly salted seeds in this recipe to keep the assembly time down to about 5 minutes flat, but raw seeds or nuts are delicious here, too. 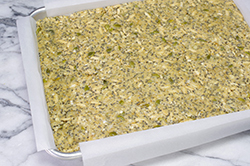 Alternatively, toast the raw seeds or nuts by spreading them on a large rimmed baking sheet and baking in a preheated 350°F oven for 6 to 8 minutes, shaking halfway through, until golden and fragrant. Add 1/4 teaspoon fine sea salt. 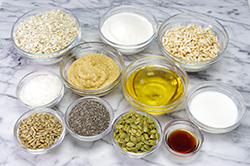 -	An equal amount of any variety of puffed or crisp whole-grain cereal – millet, amaranth, multigrain, quinoa – can be used in place of the crisp brown rice cereal. SPICY CHOCOLATE TRAIL-BLAZING BARS – Use an equal amount of chocolate protein powder in place of the vanilla protein powder. Omit the sunflower seeds and chia seeds and add 1/2 cup cacao nibs or miniature semisweet chocolate chips along with the oats. Add 1 teaspoon ground cinnamon and 1/4 teaspoon cayenne pepper along with the vanilla. 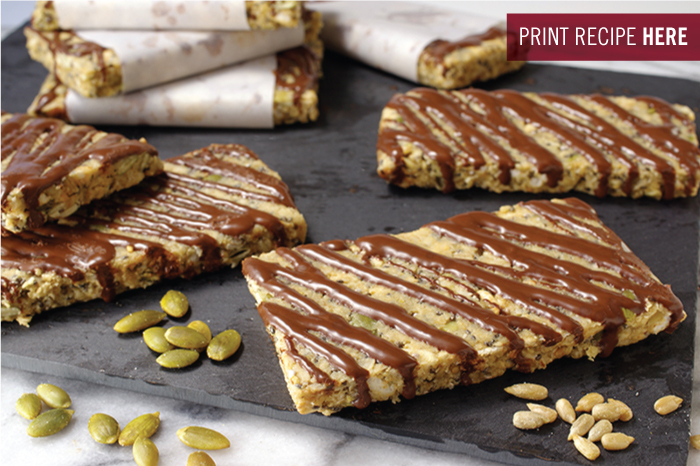 CRANBERRY-PEPITA TRAIL BARS – Omit the sunflower seeds, chia seeds, and coconut. Increase the total amount of pepitas to 1/2 cup and add 1/2 cup dried cranberries, chopped. Replace the vanilla with an equal amount of almond extract.